The signature sound of a Billy Boat Exhaust is well known in the exhaust industry. The deep, throaty tone at idle and acceleration and the no-drone in the cabin at cruise is a result of our 25 years of engineering, testing, and experience, both on the street and on the track. 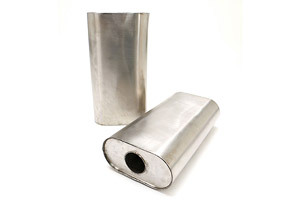 We have now made these specialty mufflers available in universal applications. Each type of muffler is designed to “tune” your exhaust system, creating an individual tone that is music to your ears. Below you’ll find two products with our signature BBE technologies and sound controls adaptable to your vehicle project needs. Billy Boat Exhaust Timbre Cylinder in of itself was designed to define the character or quality of a sound as distinct from its pitch and intensity. Built on the same concept as our PRT Exhaust Systems, the Timbre Cylinder offers a flexible component of design, balance and sound applicable to most any custom exhaust. The Billy Boat Exhaust Benchmark Muffler gives you the option to adopt our classic deep, throaty muscle car tone on a universal level. While most muffler companies use a standard round tube design, Billy Boat Exhaust uses a square tube design. This tube design allows for more volume in the muffler tube and also allows for a more perforated surface area inside the tube. More volume means better flow and less restriction, while the increased surface area means more perforated material to absorb sound waves. We also use perforated arrows inside the tubes to direct the exhaust flow in a lazy S pattern, helping to increase the efficiency of the absorption side of the muffler. 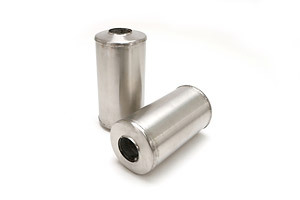 You’ll also find two different types of packing materials in our mufflers, a stainless steel mesh material, and an extremely high-temperature ceramic material. The stainless steel mesh is wrapped around all muffler cores to add a layer of durability to each muffler, while the ceramic material is used as a softly packed void fill around the core of the muffler chamber. Utilizing these different packing materials around perforated square tube cores is equally as important as the design, as different materials have different acoustic properties. These materials are durable and provide a lifetime of enjoyment…yet also emit the rich tones which create our deep, throaty muscle car signature tone. Use separately or in combination with our Timbre Cylinder.